Built in the 1940s, the Beilen railway station experiences only limited activity on the platforms at night. The Dutch railway operator ProRail/NS aims to make Beilen and other stations in the Netherlands more safe and sustainable with a focus on the environment and society. In particular, ProRail intends to achieve a reduction in energy use, and the resulting CO2 emissions of at least 30% before 2015 by applying innovative solutions such as intelligent lighting. 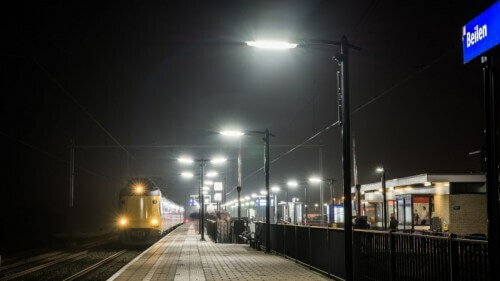 Extending over 400 meters (1300 ft), the Beilen railway platforms are fully lit throughout the night even though they experience only limited activity. Local residents complained about the excessive light levels and even suggested to switch-off lights during off-peak hours. While simply turning the lights off would indeed reduce energy usage, the resulting darkness would make the train stations less safe. Considering the safety and security of passengers and personnel, ProRail decided against switching the platform lights off. Instead, ProRail decided to search for solutions that would reduce energy usage without compromising safety and passenger experience on the platforms. ProRail decided to apply Tvilight’s adaptive lighting solution (CitySense) throughout the station including platforms, overhead structures, tunnels and outdoor parking spaces. With Tvilight’s system, the lights automatically dim (to 40%) during off-peak hours when no one is around. As soon as any presence is detected, all the lights surrounding the occupant glow to full brightness. This ensures that there is sufficient light around occupants at all times making them feel safe and comfortable. The solution also enables ProRail to collect useful statistics including passenger activity and energy consumption/savings. The solution has now been implemented in three stations (Beilen, Hoogeveen and Meppel) and has received positive reviews from passengers and personnel. It has proven to be energy efficient without compromising the commuters’ sense of safety.